One of the consequences of the economic downturn and the resulting increase in vacant shops has been the need for innovative mitigating measures – whether that’s creating the illusion of an occupied shop, or coming up with appealing window displays that help to enliven the street scene. Here in Newcastle, the former Mortgage Advice Centre at 53 Westgate Road is a shop/office unit that has been empty for at least a year, and that I pass on my way to work every day. 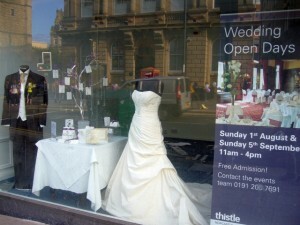 Part of the County Thistle Hotel, I was pleased to see in recent days that the space is being temporarily used to good effect, showcasing the hotel’s Wedding Open Days. 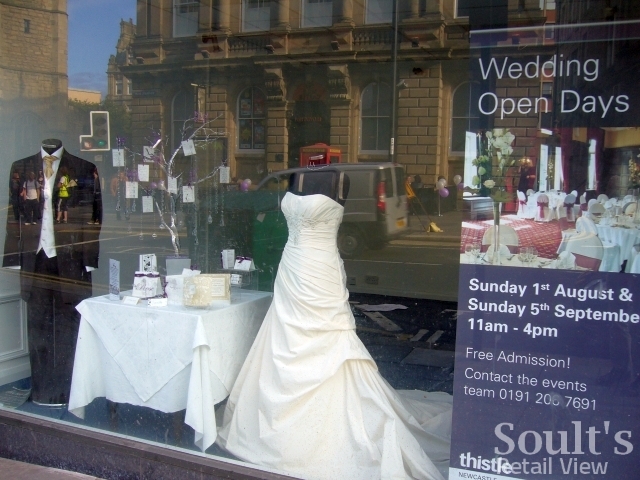 The window is nicely dressed, featuring a wedding gown and suit, a table bedecked with cards and invitations, and a good looking roller banner. 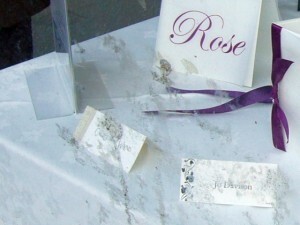 The problem, however, is that no-one thought to clean the filthy windows before setting up the display. Consequently, what is supposed to come across as aspirational and luxurious rather loses its impact and appeal. If Bob’s ever on Tyneside, I think I’d better suggest that he avoids Westgate Road. Hi Graham, In the states we often say, “the devil is in the details.” Such a simple thing: clean the dang windows before filling them. What a miss for the retailer and the bride to be. 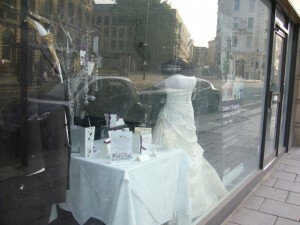 Does she really want to dwell on how ugly her wedding could be? Of course not.